In chronic kidney disease (CKD), enhanced intrarenal angiotensin II (AngII) is involved in deterioration of renal function, but it is difficult to measure it. For assessment of the potential of urinary angiotensinogen as a marker of intrarenal AngII activity, the correlation of plasma and urinary renin-angiotensin system components, including angiotensinogen, with deterioration of renal function was investigated in 80 patients who had CKD and were not treated with AngII blocking agents. Changes that were induced by 14 d of losartan treatment (25 mg/d) were also measured in 28 patients. Angiotensinogen was measured by RIA of AngI after incubation with renin. Urinary angiotensinogen levels were greater in patients with low estimated GFR and elevated urinary protein and type IV collagen and correlated with renal AngII and type I collagen immunostaining intensities. The risk for deterioration of renal function (i.e., estimated GFR decline of >2.5 ml/min per yr) during a mean follow-up period of 23 mo (maximum 43 mo) was associated with urinary angiotensinogen of >3.0 nmol AngI equivalent per 1 g of urinary creatinine (AngI Eq/g Cre) at enrollment (hazard ratio 3.52). The event-free survival for deterioration of renal function was better in patients with urinary angiotensinogen <3.0 nmol AngI Eq/g Cre than those >3.0 nmol AngI Eq/g Cre. Losartan reduced urinary and plasma angiotensinogen, urinary protein and type IV collagen, and systolic BP, despite concomitant increases in plasma renin and AngII. These data suggest that urinary angiotensinogen is a potentially suitable marker of intrarenal AngII activity associated with increased risk for deterioration of renal function in patients with CKD. Chronic kidney disease (CKD) that results in ESRD is a major international health problem. It was also reported that CKD is an independent risk state for cardiovascular disease (1). The crucial role of angiotensin II (AngII), the major effector of the renin-angiotensin system (RAS), in the development of renal fibrosis that results in ESRD is widely recognized. AngII-blocking agents, such as angiotensin-converting enzyme inhibitors (ACEI) and AngII receptor blockers (ARB), provide additional renoprotection beyond that of BP control (2). AngII is usually produced in the bloodstream by the action of renin on angiotensinogen to form AngI, which is further cleaved by ACE to form AngII. However, organ-specific production of AngII has also been recognized in various organs, such as kidney and heart (3,4), and such local production seems to be unrelated to the systemic release of AngII (4,5). There is evidence that local tissue contents and interstitial fluid concentrations of AngII in the kidney are far greater than can be explained solely on the basis of equilibration with circulating concentrations (6–8). In fact, several studies have demonstrated that much of the intrarenal AngII is derived from locally formed angiotensinogen in the kidney (8–13). Increases in intrarenal RAS components, particularly AngII, in parallel with the severity of fibrotic renal damage, have been demonstrated in chronic progressive nephropathy in rat (14) and human (15). Although urinary AngII was proposed previously as a marker of intrarenal AngII activity (16), it has not been consistently shown to reflect intrarenal AngII activity. At present, no clinical marker is available to evaluate intrarenal AngII activity because it is difficult to measure it directly in patients. Angiotensinogen is the only known substrate for renin, and the levels of angiotensinogen in human and rat are close to the Km value for renin (17). Therefore, changes in either angiotensinogen (substrate) or renin (enzyme) could influence RAS activity. Several in vitro studies demonstrated the positive feedback of AngII on angiotensinogen expression in hepatocytes, cardiac myocytes, and proximal tubular cells (18–21). Kobori et al. reported that urinary angiotensinogen level correlates with intrarenal angiotensinogen and AngII levels in AngII-induced (10,11) and spontaneous (22) hypertensive rats. However, it is unknown whether urinary angiotensinogen can be used as a marker of intrarenal AngII activity in patients with CKD. This study was designed to determine the potential of urinary angiotensinogen as a marker of intrarenal AngII activity associated with increased risk for deterioration of renal function in patients with CKD. For this purpose, we investigated the correlation of plasma and urinary RAS components, including angiotensinogen, with deterioration of renal function in 80 patients who had CKD and were not treated with ACEI or ARB. The levels of urinary angiotensinogen were compared with renal AngII and type I collagen immunostaining intensities in consecutive kidney sections. We prospectively analyzed the risk for decline of estimated GFR (eGFR) of >2.5 ml/min per yr during a mean follow-up period of 23 mo (maximum 43) in 49 patients who had not dropped out or had not been introduced to hemodialysis within 3 mo of enrollment. We also investigated the effects of losartan, an ARB, on circulating and urinary RAS components, including angiotensinogen. Eighty patients who had CKD, were hospitalized in Hamamatsu University Hospital between February 2003 and May 2005, had not received ACEI or ARB, and gave informed consent were included in the study. The study protocol was approved by the ethics committee of Hamamatsu University School of Medicine. The patients included 37 women and 43 men with a mean age of 52 yr (range 18 to 94 yr). The eGFR ranged from 5 to 111 ml/min (mean 54 ml/min). The eGFR was calculated using the Cockcroft-Gault formula (23), which was found to correlate well with GFR corrected for body surface area in adults (24). The background renal diseases were IgA nephropathy (n = 17), diabetic nephropathy (n = 14), lupus nephritis (n = 8), membranous nephropathy (n = 4), minimal-change disease (n = 3), nephrosclerosis (n = 3), purpura nephritis (n = 3), non-IgA nephropathy (n = 3), chronic interstitial nephritis (n = 3), membranoproliferative glomerulonephritis (n = 2), FSGS (n = 1), and chronic renal failure without renal biopsy data (n = 19). Our preliminary study indicated that the levels of urinary angiotensinogen decreased to almost half in urine samples that were stored overnight at room temperature. Because the levels of circulating RAS components are affected by postural changes (25), we measured the levels of plasma and urinary RAS components in blood samples that were collected at bed rest early in the morning and fresh urine samples that were collected after waking up in hospitalized patients with CKD. For measurement of plasma renin activity, plasma and urinary angiotensinogen, AngII, and aldosterone, blood and fresh urine samples were collected in tubes that contained 4 mM EDTA, ice-cooled immediately, centrifuged, and stored at −70°C until use. Urinary angiotensinogen, AngII, aldosterone, and type IV collagen levels were expressed per 1 g of urinary creatinine (g Cre). Plasma samples that were diluted 1:200 with 0.2 M PBS that contained 125 mM EDTA, 1 mM captopril, and 50 mM PMSF and urine samples that were diluted 1:10 were incubated with 150 pM recombinant human renin at 37°C for 18 h. Recombinant human renin was prepared as described previously (26). The reaction mixtures were mixed with 30 mg of Florisil (Sigma-Aldrich Japan, Tokyo, Japan), incubated for 10 min, centrifuged, washed twice with ultra pure water, and eluted with acetone that contained 0.5 N HCl. The levels of AngI were then measured by RIA (SRL, Tokyo, Japan). The angiotensinogen levels were finally expressed as the equivalent amounts of AngI (AngI Eq) by subtracting AngI levels in untreated samples from those in the renin-treated samples. Our preliminary study showed that the generated AngI level reached a plateau after >18 h of incubation with 150 pM human renin at 37°C in these samples. The sensitivity of the standard curve, defined as the smallest value that can be distinguished from zero, was 23 fmol AngI Eq/ml. Coefficients of variation of intra- and interexperimental measurements of angiotensinogen were 9.5 and 13.2% in plasma samples and 11.6 and 13.7% in urine samples, respectively. The relationships among circulating and urinary RAS components and renal function at enrollment were analyzed in 80 patients who had CKD and were not treated with ACEI or ARB. For examination of the effects of losartan treatment, plasma and urine samples were also collected after a 14-d administration of losartan 25 mg/d in 28 patients. Four (14%) patients also received loop diuretics, and the dosages were not changed during the 14-d study period. Patients who were treated with losartan were selected by a clinical decision of the attending physicians, who were not involved in the study. Therefore, patients with hyperkalemia, severe renal failure, or hypotension were not included in this part of the study. We investigated the effects of low-dosage losartan because eGFR at enrollment was low in some patients. Thirty-one of 80 patients who had dropped out by moving to other hospitals or had been introduced to hemodialysis within 3 mo of enrollment were excluded from the follow-up study. The creatinine clearance is reported to diminish with age by approximately 0.75 ml/min per yr (27), and falls in GFR were <2.5 ml/min per yr in four clinical trials in patients with CKD, in which the mean BP was controlled at 100 mmHg or less (28). Therefore, we defined deterioration of renal function in this study as falls in eGFR of >2.5 ml/min per yr, and the risk for deterioration of renal function was analyzed prospectively in 49 patients with CKD during a mean follow-up period of 23 mo (maximum 43 mo). eGFR was measured monthly, and any change was evaluated relative to more than 3-mo data in each patient. The kidney biopsy specimens were available in 45 of 80 enrolled patients with CKD. To examine whether the levels of urinary angiotensinogen correlated with those of intrarenal AngII and renal fibrosis, we performed immunostaining for AngII and type I collagen using a biotin-streptavidin-peroxidase method as described previously (29) in consecutive kidney sections that were obtained from 35 patients who had CKD and in whom renal biopsy was performed within 3 mo of measurement of urinary angiotensinogen. Microwave irradiation was performed to enhance antigen retrieval. The primary antibodies were rabbit anti-human AngII (Peninsula Laboratories, San Carlos, CA) and mouse anti-human type I collagen (Daiichi Fine Chemical, Takaoka, Japan). The secondary antibodies were biotinylated donkey anti-rabbit IgG and donkey anti-mouse IgG (Chemicon, Temecula, CA). Sections that were incubated with nonimmune rabbit or mouse sera, as appropriate, instead of the primary antibodies served as negative controls. All sections were stained under identical conditions together with control incubation. Nuclei were counterstained lightly with hematoxylin. The immunoreactivities for AngII and type I collagen were scored in a blind manner as follows and were compared with the urinary angiotensinogen levels: 0, nil; 1, mild; 2, moderate; 3, strong immunostaining. We first conducted Pearson and Spearman single regression analyses for parametric and nonparametric data, respectively, among all parameters studied. Then, factors with significant single correlation with urinary angiotensinogen were adopted as explanatory variables in multiple regression analysis. To reduce the impact of multicollinearity, we selected explanatory variables so that the mean sum of squares for the residual would be minimal in multiple regression analysis. As a result, diastolic BP was excluded. Because urinary angiotensinogen, AngII, aldosterone, type IV collagen, and protein levels deviated from the normal distribution, the extent of the deviation was substantially reduced by common logarithmic transformation. The Kaplan-Meier method with the log-rank test was used for survival analysis on the end point of increased risk for deterioration of renal function (i.e., eGFR decline of >2.5 ml/min per yr) during the follow-up period, and predictive variables were detected by the Cox proportional hazards regression analysis, in which we set the following cutoff levels: eGFR of 60 ml/min based on the definition of CKD; urinary angiotensinogen of 3.0 nmol AngI Eq/g Cre based on the sensitivity and the specificity, which were shown in the results to detect renal dysfunction; urinary type IV collagen of 5.0 μg/g Cre based on the normal range; urinary protein of 3.0 g/d; age of 60 yr, and body mass index (BMI) of 25 kg/m2. The Wald test for global null hypothesis was performed to evaluate whether the proportional assumption was met in the study cohort. Changes in parameters before and after losartan administration were compared by paired t test or Wilcoxon signed rank test according to the distributions of their measurements. P < 0.05 was considered as statistically significant. Statistical analysis was performed with StatView software, version 5.0, for Macintosh. The correlation matrix among eGFR, urinary and plasma RAS components, urinary protein and type IV collagen, BP, age, BMI, gender, and diabetic status at the time of enrollment is shown in Table 1. Urinary angiotensinogen correlated negatively with eGFR (r = −0.74, P < 0.0001; Figure 1A) and positively with urinary type IV collagen (r = 0.78, P < 0.0001), urinary protein (r = 0.60, P < 0.0001), systolic BP (r = 0.54, P < 0.0001), urinary AngII (r = 0.44, P < 0.0001), diastolic BP (r = 0.34, P = 0.002), age (r = 0.46, P < 0.0001), and diabetic status (ρ = 0.54, P < 0.0001). Urinary angiotensinogen did not correlate significantly with plasma renin activity, plasma angiotensinogen (Figure 1B), plasma AngII, plasma and urinary aldosterone, BMI, or gender. Multiple regression analysis indicated that low eGFR (P = 0.002), high proteinuria (P < 0.0001), and high urinary type IV collagen (P = 0.003) correlated significantly with high urinary angiotensinogen (Table 2). The sensitivity of >3.0 nmol AngI Eq/g Cre of urinary angiotensinogen for prediction of moderate (eGFR <60 ml/min) and severe (eGFR <30 ml/min) renal dysfunction was 81 and 91%, and the specificity was 77 and 73%, respectively. 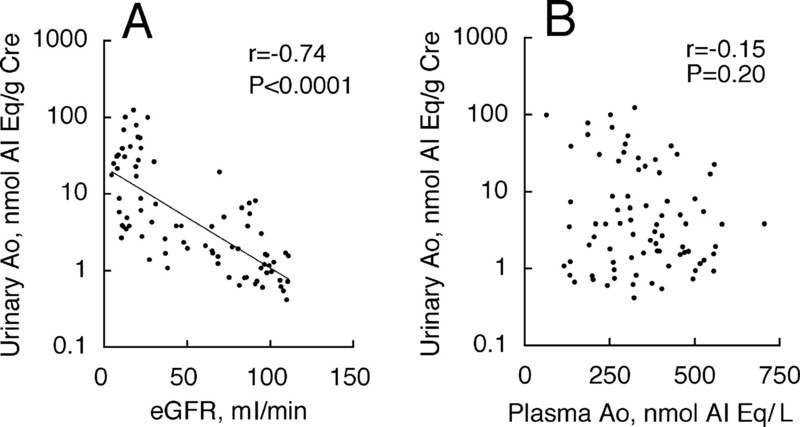 Scatter diagrams of bivariate correlations between urinary angiotensinogen and estimated GFR (eGFR; A) and plasma angiotensinogen (B). r, Pearson correlation coefficient; Ao, angiotensinogen; AngI Eq, equivalent amount of angiotensin I; g Cre, 1 g of urinary creatinine. Representative pictures of AngII and type I collagen immunostaining are shown in Figure 2. In mild mesangial proliferative glomerulonephritis, AngII staining was detected mainly in distal tubules. Mild AngII staining was also noted in brush borders, some proximal tubular cells, Bowman's epithelial cells, and some glomerular cells. Mild and focal type I collagen staining was noted in the interstitium. 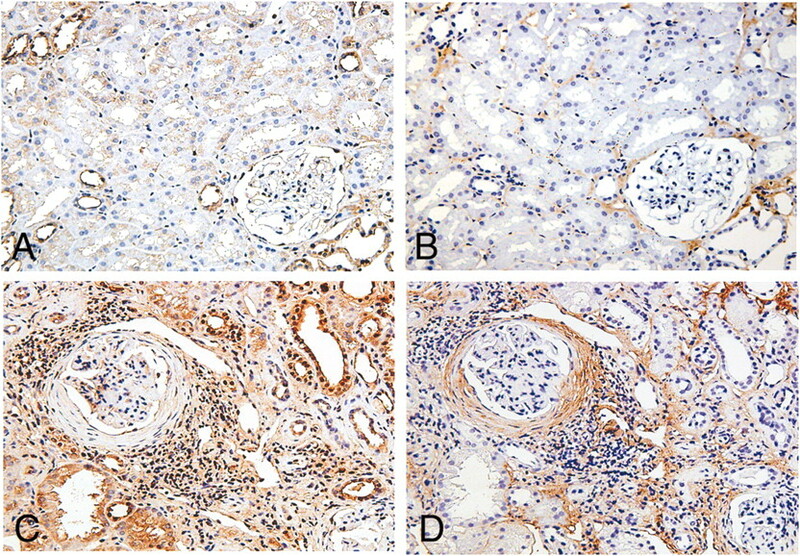 In diffuse global lupus nephritis of class IV-G (A) (30) with fibrotic tubulointerstitial lesions, increased AngII staining was noted in the glomerular and tubulointerstitial lesions. Increased interstitial type I collagen staining was also observed. Some interstitial mononuclear cells were also positive for AngII and type I collagen staining. Urinary angiotensinogen levels correlated positively with renal AngII (ρ = 0.652, P = 0.0001) and type I collagen (ρ = 0.678, P < 0.0001) immunostaining intensities (Figure 3). Immunostaining of consecutive kidney sections for angiotensin II (AngII; A and C) and type I collagen (Col I; B and D) in mild mesangial proliferative glomerulonephritis (A and B) and diffuse global lupus nephritis of class IV-G (A) with fibrotic tubulointerstitial lesions (C and D). In mild mesangial proliferative glomerulonephritis, AngII staining is detected mainly in distal tubules. Mild AngII staining is also noted in brush borders, some proximal tubular cells, Bowman's epithelial cells, and some glomerular cells. In lupus nephritis, increased AngII and Col I staining is noted in the glomerular and tubulointerstitial lesions. Some interstitial mononuclear cells are also positive for AngII and Col I staining. Magnification, ×120. Correlations between urinary angiotensinogen levels and renal AngII (A) and Col I (B) immunostaining scores in 35 patients who had chronic kidney disease (CKD) and in whom renal biopsy was performed within 3 mo of measurement of urinary angiotensinogen. The levels of urinary angiotensinogen correlated significantly with renal AngII and Col I staining scores. • and error bars represent means and SD, respectively. ρ, Spearman correlation coefficient. Kaplan-Meier test showed significant difference in event-free survival for deterioration of renal function between patients with urinary angiotensinogen levels of > and <3.0 nmol AngI Eq/g Cre at enrollment (Figure 4). The P value of the Wald test for global null hypothesis was >0.05, indicating that the hazard ratio did not change significantly during the follow-up period and the Cox proportional model fits in the follow-up study cohort. Multivariate analysis indicated that urinary angiotensinogen levels of >3.0 nmol AngI Eq/g Cre at enrollment correlated significantly with the risk for deterioration of renal function (decline in eGFR exceeding 2.5 ml/min per yr; hazard ratio 3.52; 95% confidence interval 1.21 to 10.23; Table 3). Kaplan-Meier survival curves for event-free survival of deterioration of renal function (i.e., decline in eGFR of >2.5 ml/min per yr) in the study cohort. 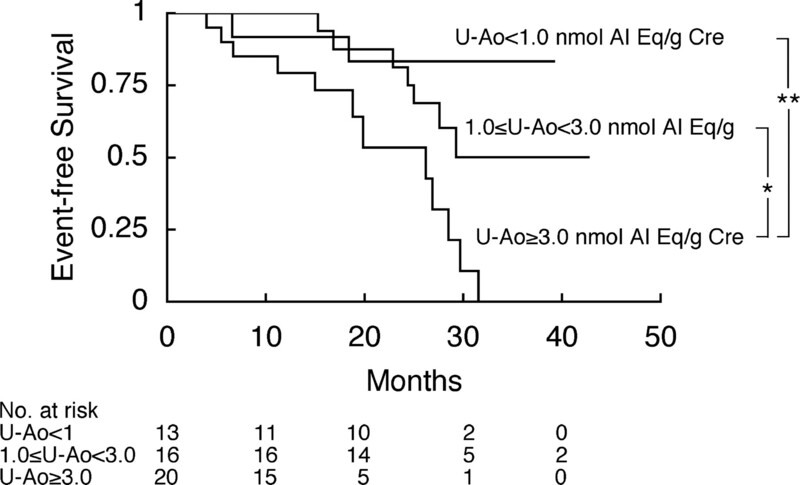 Patients were stratified into three groups according to urinary angiotensinogen levels at enrollment (first group, urinary angiotensinogen <1.0 nmol AngI Eq/g Cre; second group, 1.0 ≤ urinary angiotensinogen < 3.0 nmol AngI Eq/g Cre; third group, urinary angiotensinogen ≥3.0 nmol AngI Eq/g Cre). Fourteen-day losartan treatment at 25 mg/d reduced urinary angiotensinogen (P = 0.001), urinary protein (P < 0.0001), urinary type IV collagen (P = 0.018), plasma angiotensinogen (P = 0.014), and systolic BP (P = 0.009) and increased plasma renin activity (P = 0.001) and plasma AngII (P = 0.010; Table 4). However, the same treatment did not change urinary AngII, urinary and plasma aldosterone, urinary sodium, eGFR, or diastolic BP. Our results demonstrated that (1) urinary angiotensinogen levels were greater in patients with CKD, low eGFR, and high urinary protein and type IV collagen excretion; (2) urinary angiotensinogen levels correlated positively with renal AngII and type I collagen immunostaining intensities; (3) increased risk for deterioration of renal function (i.e., eGFR decline of >2.5 ml/min per yr) was associated with increased urinary angiotensinogen levels; and (4) losartan reduced urinary angiotensinogen levels despite concomitant increases in plasma renin activity and plasma AngII levels. These data suggest the potential of urinary angiotensinogen as a marker of intrarenal AngII activity in patients with CKD, in whom intrarenal AngII activity is increased in parallel with the severity of fibrotic renal damage. The data also demonstrated that the levels of urinary angiotensinogen could help identify patients who have CKD and are at increased risk for progressive renal failure. Recently, there has been a paradigm shift from a focus primarily on the role of the circulating RAS in BP regulation and sodium homeostasis to emphasis on the expression of organ-specific RAS involved in organ fibrosis. In the kidney, all components that are needed for AngII generation are present (12,14). Increased expression of renin, angiotensinogen, and ACE were demonstrated in kidneys of hypertensive patients and patients with CKD (12,15). AngII-induced augmentation of angiotensinogen and AngII was also demonstrated in AngII-infused hypertensive rat kidneys (13). In contrast to renin in the juxtaglomerular apparatus, renin in the collecting ducts is augmented by AngII (31). These data suggest that much of the intrarenal AngII is derived from locally formed angiotensinogen and that renal angiotensinogen expression is stimulated, at least in part, by AngII itself. In AngII-infused hypertensive rats, urinary angiotensinogen was proposed as a marker of intrarenal AngII activity because its level correlated well with intrarenal angiotensinogen and AngII levels (10,11). The increase in intrarenal AngII activity was also shown to parallel the severity of fibrotic renal damage in chronic progressive nephropathy in rat (14) and human (15). In this study, urinary angiotensinogen levels were greater in patients with CKD, low eGFR, and high urinary excretion of protein and type IV collagen, a marker of renal extracellular matrix production (32,33), and correlated positively with renal AngII and type I collagen immunostaining intensities. It is conceivable that increased urinary angiotensinogen excretion in patients with low eGFR and high urinary type IV collagen excretion is due to enhanced angiotensinogen expression in the kidneys with progressive fibrosis, which is mediated by increased intrarenal AngII activity and results in progressive deterioration of renal function. This notion was further supported by the findings that urinary angiotensinogen of >3.0 nmol AngI Eq/g Cre at enrollment was associated with increased risk for deterioration of renal function with a hazard ratio of 3.52 after adjustment for eGFR, urinary type IV collagen and protein, systolic BP, age, BMI, gender, and diabetes status. The event-free survival for deterioration of renal function was significantly higher in patients with urinary angiotensinogen of <3.0 nmol AngI Eq/g Cre than those who were over the level at enrollment. Our results also demonstrated that the levels of urinary angiotensinogen were reduced by losartan, which is thought to suppress intrarenal AngII activity, despite the concomitant rises in plasma renin activity and plasma AngII. A decrease in intrarenal AngII induced by candesartan, another ARB, has been reported in Dahl salt-sensitive rats on a high salt intake, despite the increase in plasma AngII (34). Taken together, these results suggest the potential of urinary angiotensinogen as a marker of intrarenal AngII activity involved in the progression of renal fibrosis with subsequent deterioration of renal function in patients with CKD. It is plausible that plasma angiotensinogen cannot easily filter across the glomerular membrane because of its size (9). It is widely known that >3.5 g/d proteinuria, mainly albuminuria, causes a marked decrease of serum albumin level to <30 g/L in nephrotic syndrome. As shown in Figure 1B, the levels of urinary angiotensinogen ranged between 0.4 and 124 nmol AngI Eq/g Cre excretion, and those of plasma angiotensinogen were between 63 and 705 nmol AngI Eq/L. Because the daily urinary creatinine excretion is nearly 1 g in adults, the urinary angiotensinogen levels that were observed in this study seem high enough to cause significant decreases in plasma angiotensinogen in some patients, if the urinary angiotensinogen originated from the circulation and filtered across the glomerular membrane. However, we found no significant correlation between urinary and plasma angiotensinogen levels. It is therefore unlikely that most of the increased urinary angiotensinogen in patients with high proteinuria originated from the circulation, although we cannot completely rule out the possible contribution of derangement of glomerular permeability, which could result from progressive renal fibrosis, to the increased urinary angiotensinogen. Losartan also decreased plasma angiotensinogen levels. A decrease in plasma angiotensinogen induced by losartan or enalapril, an ACEI, has been demonstrated in spontaneously hypertensive rats, despite concomitant increases in plasma and renal renin and plasma AngII (35). Because the majority of plasma angiotensinogen originates from the liver (36), such losartan-induced decrease in plasma angiotensinogen may reflect the effect of ARB on systemic angiotensinogen expression mediated by AngII. We measured angiotensinogen levels by measuring AngI released by excess renin. Recently, an ELISA that used anti-angiotensinogen antibody was reported (37,38). In contrast to our measurement that detects intact angiotensinogen only, the ELISA detects intact angiotensinogen as well as its inactive residue, the des-angiotensin I-angiotensinogen (des-AngI-Ao), cleaved by renin (39). Clauser et al. (39) reported that no significant changes in the circulating levels of total angiotensinogen, composed of intact angiotensinogen and des-AngI-Ao, were observed by the RIA using anti-angiotensinogen antibody in sodium-depleted, captopril-treated, or adrenalectomized rats, although intact angiotensinogen levels, measured using renin, were decreased in proportion to the elevation of renin levels in these conditions. Because plasma des-AngI-Ao levels correlate with plasma renin levels (40), we consider that the ELISA is not superior to the method that uses renin to detect angiotensinogen that is induced by increased intrarenal AngII activity in patients with CKD. We have demonstrated in this study the presence of high urinary angiotensinogen levels in patients with low eGFR, high urinary protein and type IV collagen excretion, and increased renal AngII and type I collagen expression and that treatment with losartan reduced urinary angiotensinogen levels. Increased risk for deterioration of renal function was associated with increased urinary angiotensinogen levels. Our data suggest the potential of urinary angiotensinogen as a novel tool for evaluation of intrarenal AngII activity and for identification of patients who have CKD and are at increased risk for progressive deterioration of renal function. However, our study has certain limitations, including the small sample size, concomitant wide confidence intervals of the hazard ratios, and the dichotomizing approach in the Cox proportional hazards regression analysis. Further studies with a larger patient population are clearly needed. This study was supported by a clinical research grant from Hamamatsu University School of Medicine and in part by a Grant-in-Aid for Scientific Research (17590824 to T.Y.) from the Ministry of Education, Culture, Sports, Science and Technology, Japan. Portions of this study were presented in abstract forms at the 38th (November 8 to 13, 2005; Philadelphia, PA) and 39th Annual Renal Week Meetings (November 14 to 19, 2006; San Diego, CA) of the American Society of Nephrology. The authors thank Takahito Kaji from Banyu Pharmaceutical Co. (Tokyo, Japan) for the advice on statistical analysis.